There still are a couple of Barbie houses tucked away in one corner. 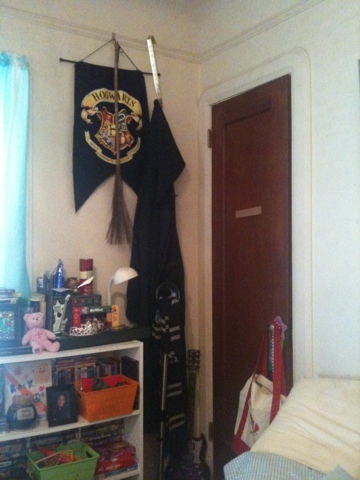 And a shrine to a wizard named Harry Potter in the other. Behind the door is a bookcase filled with the leftovers from her obsession with The Wizard of Oz, an assortment of books she may or may not have read and a huge collection of board games thanks to Santa (and mom's idea that we should have Family Game Night like the folks on TV). And there still are a few teddy bears and Beanie Babies gathering dust. But the rest of it is mine. After several weeks of contemplation and two weekends of perspiration, I finally have a room to call my own. Sort of. "We're sharing it," says my 10-year-old daughter. "It's still mine." Yeah well kid, it was mine first. When we first discovered our antique little cottage nearly 17 years ago, this was just a quirky little spare room. Emphasis on the quirky. There is one door that opens into the hallway and another that opens onto the side porch outside. Windows overlook the driveway. 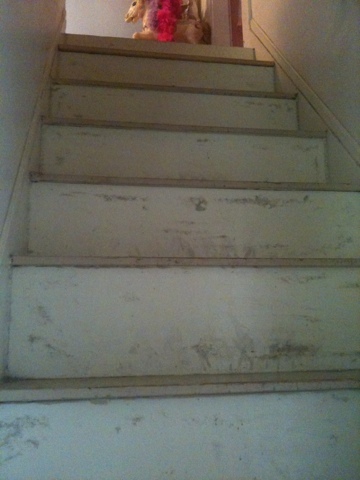 Then there is my one sheetrocked wall (the rest are plaster), behind which is the steepest, narrowest, scariest set of attic stairs you've ever seen. Guests have taken one look at these things and balked. My own mother hasn't been up them in 10 years. It took our poor dogs forever to master them. Can't say I blame them. They have to perform a near circus trick to come down, their bodies nearly vertical in the air. It took us a while to master them as well. Although the quirkiness of our house continues upstairs, where the attic has been converted into two bedrooms, a closet that would make you jealous, and a tiny bathroom with ceilings designed only for short people, Marty and I chose to put our bedroom up there. The bed is in the middle of the room, loft-style. And Marty knows when he needs a haircut when his hair touches the ceiling. 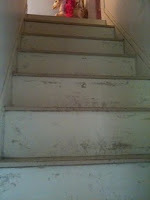 The cool thing is, if you don't know those stairs are there, you'd never know they were there. I count on that anyways in case we ever have a home invasion, imagining the intruders looking around dumbfounded and asking themselves, "Where in the heck did they go?" The previous owner had set up a huge garment rack in this room and used it as a giant closet. Although necessity is the mother of invention, I say she had no imagination. When we moved in, I turned it into a study. A home office. I bought white bookcases and filled them with all my books -- my Civil War collection, my genealogy collection, my Stephen King collection. I spent many sleepless nights tracing my family tree and puttering. 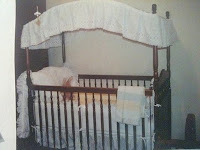 And waiting for the day I would finally be able to transform it into a nursery. But finally the day came. Anxious. Terrified. 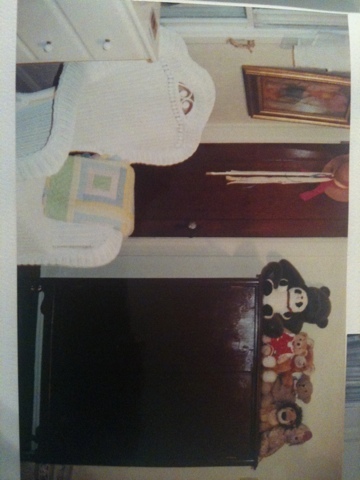 I deliberately waited until 10 weeks before the date she was due to get started, to repaint the walls, to clear out my books, to set up the crib my sister-in-law had stored away for me, to buy the white wicker rocker just like my grandmother's. And it was perfect. Airy and light, filled with white eyelet and tulle and carousel horses because Marty had proposed to me on the antique carousel at City Park. Then, 19 days before she was due, her mother changed her mind. For the next two months I was forced to walk through this beautiful nursery every day, on my way to my own bedroom and back -- this beautiful empty nursery -- wondering if it ever would be filled. Of course it was, in January of 2001, with the most perfect angel of a baby in the world, the one I was supposed to have. 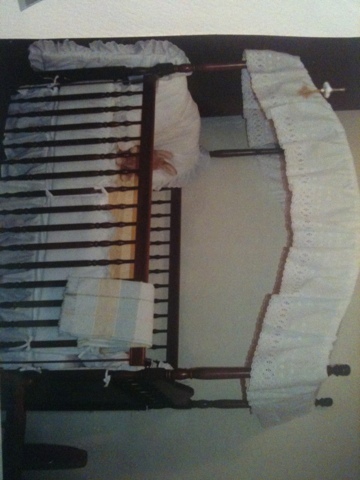 This is the room where I rocked her to sleep in my white wicker rocker, where we sang along to Linda Ronstadt's lullabies, where I picked her outfit of the day, where we danced to Patsy Cline, where we had our first tea party on a blanket on the floor. When she grew out of her crib, we decided to move her upstairs with us, painting the walls of the other tiny, tepee shaped bedroom bubble gum pink because that's what she wanted. And the nursery was converted into a toy room, where all the kids could gather and play to their hearts content then leave the mess for me. Then she got older. And I had one sheetrocked wall to play with. 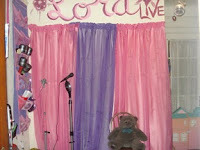 Lora loved to sing, so one day I decided to turn it into a rock star's room. 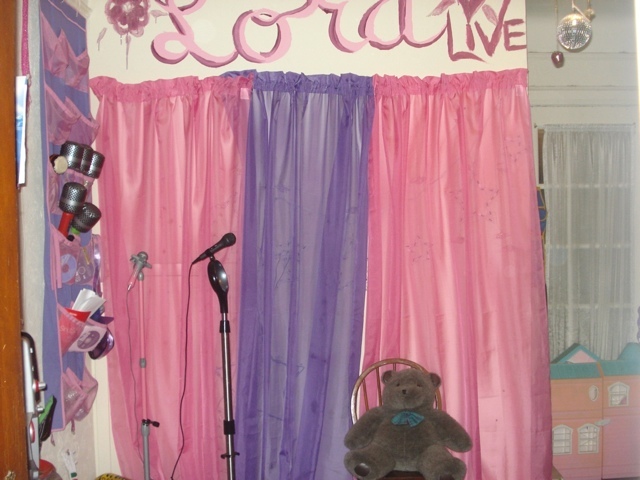 I hung pink and purple sheers on the wall (stapled them) and some cool star Christmas lights, and her uncle made her a real stage and stained it to look like hardwood. And it was good. We had several karaoke parties on it and some good times belting out Garth Brooks as a family. Then she moved on to something else. Just a few months ago I took her to Big Lots and let her pick out this crazy bed-in-a-bag set -- orange and green and purple, of all colors -- and we turned it into a "Tween Cave." She loved it. Spent one or two days in it. Then she moved on to something else, and spent most of her time in the other spare bedroom -- her Dad's Cave -- in the recliner or in the bed. Space was being wasted. So I staked my claim. I took my room back. And now it is mine again. I raised the stage on top of two sets of plastic drawers to make a desk, repainted the wall a bright white, hung up a shelf, gathered all of my favorite blue beach-colored items, brought that ugly orange and green stuff up to her bedroom and moved in. And I love it. I spent hours last night just looking at everything, taking it all in, finding my Zen. "We need a name for my room," I said to Lora. "What are we going to call it?" "Duh," she said, rolling her eyes at me. 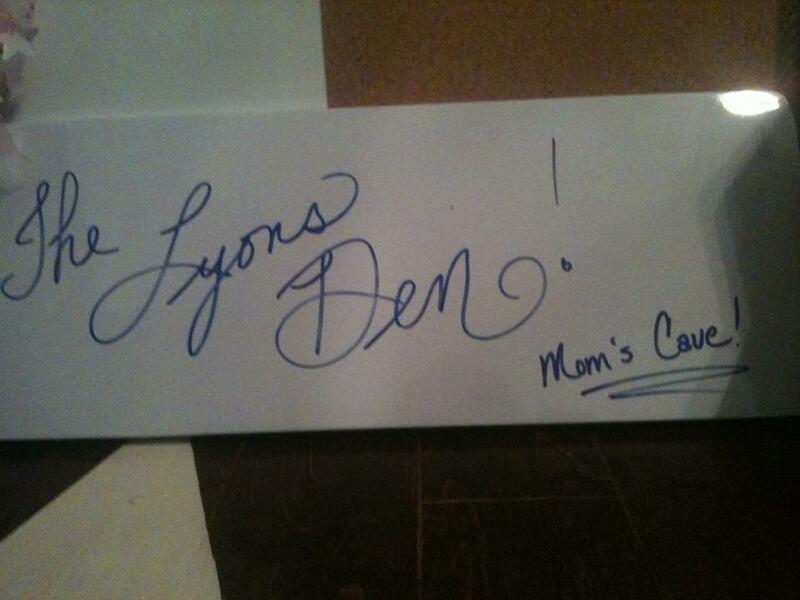 "The Lyons Den." dream, love, hope and remember. Even if I do have to share with Harry Potter. *editor's note... the photos would be much prettier if I had my desktop, but it's in recovery. Sorry. I am so jealous. 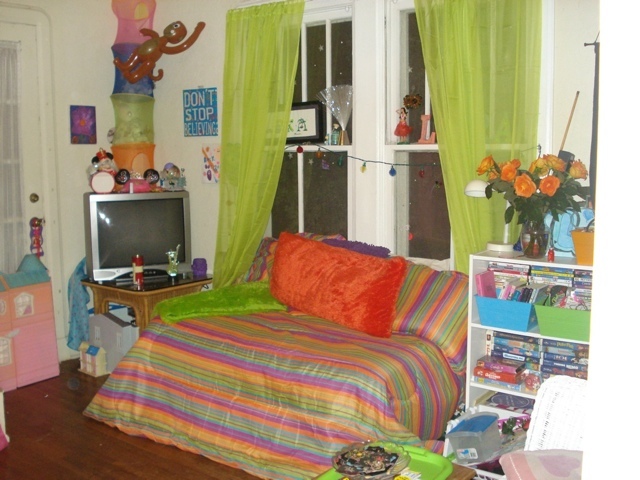 I spent 12 years keeping my eye on our smallest bedroom and planning an art room to paint in someday. My daughter has been gone a few weeks and before I could gather my thoughts that she was gone, my husband stuck a futon, giant tv and a sound system in it and claimed the Man Cave. But he picked out his own curtains. It's so cute. I gave the Hubs the spare bedroom and let him make it The Man Cave -- mainly because it got the ugly recliner out of my living room. Then Lora invaded his territory. 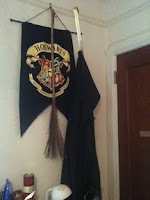 So now he's got the living room, she's got the bedroom and I have MINE!!!... All I need now is a good flat screen and another cable box..